Announcement Thank you for visiting Judy Evans' Collection of Decorative Switch Plate Covers, Swarovski Crystal Sun Catchers and Stained Glass Sun Catchers - Home to unique handcrafted pieces of art that are unusual and eclectic. 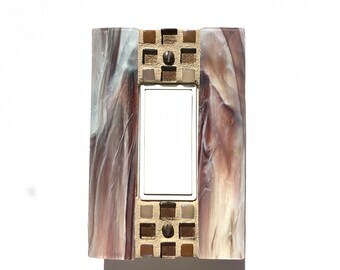 These light switch covers are undoubtedly a decorative way to replace those boring white or ivory plastic light switch covers. And the one of a kind Swarovski crystal sun catchers and stained glass sun catchers are a way to add something special to your home. Thank you for visiting Judy Evans' Collection of Decorative Switch Plate Covers, Swarovski Crystal Sun Catchers and Stained Glass Sun Catchers - Home to unique handcrafted pieces of art that are unusual and eclectic. These light switch covers are undoubtedly a decorative way to replace those boring white or ivory plastic light switch covers. And the one of a kind Swarovski crystal sun catchers and stained glass sun catchers are a way to add something special to your home. This is an additional order that I'd ordered from Judy, and she did a FANTASTIC job of matching the previous items ordered. There is no hesitation on my part, I would definitely ask Judy's assistance. She is so very talented, and a pleasure to work with. 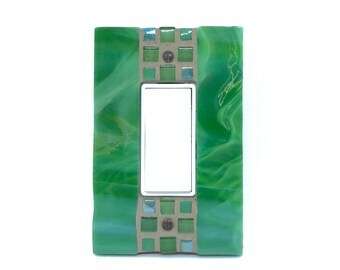 I ordered this switchplate and one other on the basis of how much I loved the first one I ordered from Judy. I don't think this will be the last! Each piece is colorful, high quality, and beautiful. Such a simple way to brighten a room! 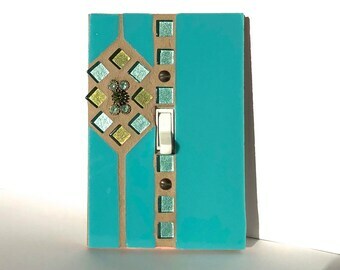 Love the switchplate! Exactly as pictured and looks so nice in the room. Creative and unique. Thank you for visiting Judy Evans' Collection - Home to unique handcrafted mosaic stained glass switch plates and stained glass sun catchers. My mission is to provide you with creative works of art that will make your home feel and look great! Casual or elegant, there's something for everyone. I hope you'll be pleased at the variety of the pieces and their reasonable prices. Thanks for visiting Judy Evans' Collection. I appreciate your support of my small business. My personal goal is that every customer is completely happy with their purchase. Except for custom orders, the item shown in the photos is the item you will receive. All sizes are are listed in the description. Please confirm before purchasing that the item is the size you want and need. Fortunately I've never had an issue with shipments received damaged or customers receiving something that wasn't what they were expecting. If for any reason you're not happy with your order please contact me WITHIN 24 HOURS of receipt and we'll work it out. Returns of stock items are accepted in their original condition within 3 days of receipt and items must be returned in their original condition and package. Unfortunately shipping fees are not refundable. PLEASE CONTACT ME PRIOR to return. We reserved the right to refuse a refund if items are not returned as mentioned. Etsy and PayPal keeps your payment information secure. Judy Evans Collection never receives your credit card information. PayPal is gladly accepted as the easiest and most reliable process - it's fast, easy & free. You do not need a PayPal account to purchase using your credit card or debit card. PayPal payments are due with in three (3) days of your purchase or I will need to cancel and relist the item(s). Money orders and checks are also welcomed and expected with seven (7) working days. When cleared, I will immediately ship your purchase. California sales tax will be added to any purchases shipped to a California address. Those states that charge tax on online purchases will also be charged their applicable sales tax amount. Please contact me if there is a problem with payment. If payment has not been received by the time indicated above, I will need to cancel the order and relist the item. Your in-stock purchase will be shipped within 1-3 business days of received payment. All products are shipped via USPS Priority Mail and tracking information is always included. Delivery is usually within 1-3 business days. Insurance up to $50.00 is always included. If your purchase totals more than $50 and you would like to increase the insurance amount please contact me prior to payment & I'll adjust the invoice accordingly. Due to the many steps involved custom orders are usually shipped in 4-6 weeks from the time payment is received, via USPS Priority Mail. If you provide a shipping address that is different than what's on Etsy or PayPal I'll ship to the address you provided. INTERNATIONAL SHIPPING - Unfortunately I do not ship internationally. If you require a RUSHED SHIPMENT please contact me PRIOR TO PAYMENT to make arrangements. I will add in the additional cost to the listing and reserve it for you only. Judy Evans' Collection's customer service goal is simple: I am committed to providing my customers total satisfaction. Every time - Guaranteed. I love custom orders. Please contact me if you want me to make you something special. - - - WHERE CAN I SEE MORE? - - - CAN I GET SOMETHING IN A DIFFERENT COLOR OR SIZE? Custom orders are always welcome! Just contact me and we'll discuss in order to get you exactly what you want. - - - WHERE CAN I FIND THE SIZING DETAILS? You'll find the sizes in the description of each item. Everything is measured in inches. If you have any questions please send me a message and I'll get back to you as quickly as possible. - - - CAN I HANG THE SUN CATCHERS OUTSIDE? 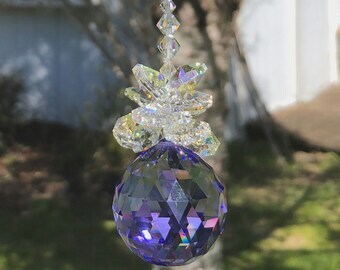 SWAROVSKI CRYSTAL SUN CATCHERS can be hung outside. They're beautiful in a tree, hanging on a hook or on your patio or porch. 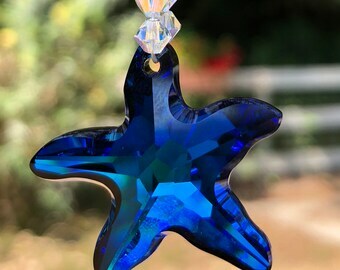 I have one hanging in my lilac tree and I love how it sparkles. STAINED GLASS SUN CATCHERS are not recommended for outdoor use. They are all glass and is subject to breakage if not protected. Even a slight breeze may cause the stained glass to break. 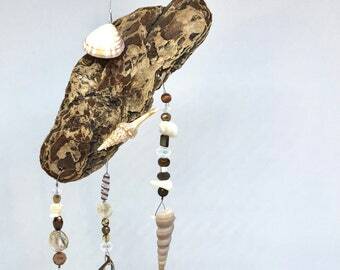 However, they are beautiful hung inside suspended from a doorway or ceiling, in front of a window or anyplace in your home to add a splash of color. - - - HOW DO I CLEAN THE SUN CATCHERS AND SWITCH PLATES? SWITCH PLATES can easily be cleaned with a damp cloth. You may notice that the copper tape on the outside edge will darken slightly. This is normal. 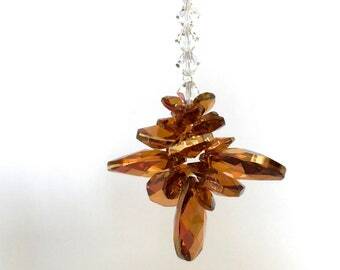 SWAROVSKI CRYSTAL SUN CATCHERS are fragile and should be cleaned carefully. Just fill a bowl with hot water and everyday dish soap. Let your sun catcher soak for a bit then hold under running water to rinse. Gently wrap in a clean dry cloth to absorb the water and hang to finish drying. Sterling silver components can be polished with a silver cleaning cloth. STAINED GLASS SUN CATCHERS are all glass and should be handled carefully. Spray glass cleaner on a paper towel and wipe each piece of stained glass and the glass beads. - - - WHAT IS AB? Aurora Borealis (AB) is an iridescent coating named after the beautiful Northern Lights that decorate the arctic skies. It is on one side of each AB crystal bead and pendant. 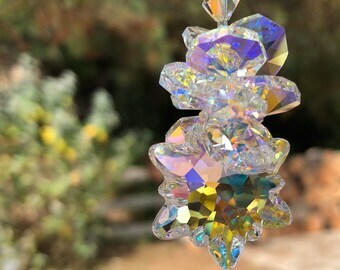 It has a mirror-like effect to allow the crystals to produce beautiful rainbows and prisms with a little help from the sun. And even without the sun it will sparkle and shine with the reflection of room lighting. The AB finish can be difficult to perfectly capture in photos, some images may capture the blue flash, others may capture a yellow or pink flash. Their subtle iridescence blends nearly effortlessly with most other colors! - - - WHAT CRYSTALS SPARKLE THE MOST? All of the Swarovski crystals that I use will sparkle and shine; they all make beautiful rainbows but some more than others. Clear AB, clear and the lighter colors will give the most rainbows and sparkles. Darker crystals like red, emerald and dark blue will usually give your crystal sun catchers more of a dramatic impact, however you won't see as many rainbows and prisms. In my opinion the light colors are softer and more gentle. They seem to be more feminine. The deeper and darker colors have more of a dramatic flair and of course offer more color impact. The choice is yours! 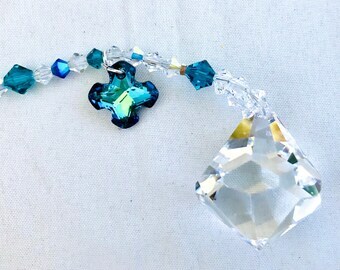 Another fact that affects the quantity of sparkles is the size and number of facets on each Swarovski crystal and pendant. The larger the facet, or flat surface, the larger the rainbows and sparkles. 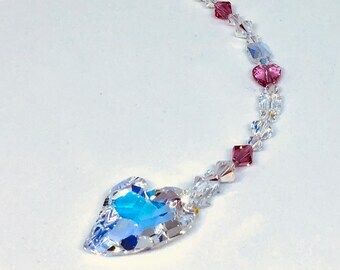 And the more facets on each crystal bead or pendant the more rainbows and sparkles. You can see the difference in the photos of each sun catcher. - - - DO YOU OFFER GIFT WRAPPING? Due to the nature of each item gift wrapping is not available. However if you want me to send the item directly to your recipient I'm happy to include a message from you in a card. Just let me know what you would like the note to say in the "note to seller" section when you check out. And don't forget to change the ship to address! - - - WHAT IF I NEED TO CANCEL A PURCHASE? You must request a cancellation within 6 hours of purchase. Many times I pack and mail orders the same day as the purchase. - - - CAN I RETURN AN ITEM? Returns of stock items are accepted if you contact me within 3 days of delivery. The item must be returned within 7 days of delivery in its original condition and packaging. Please pack with care; if the item is not returned in it's original condition, the buyer is responsible for any loss in value up to full price of the item. Shipping fees are non-refundable and buyer is responsible for return shipping costs. Tracking/delivery confirmation is highly recommended on returns for your security and to ensure a smooth transaction. - - - DO YOU CHARGE A RESTOCKING FEE? Not at this time. Fortunately I have very few returns. Except for custom orders, what you see in each listing is what you get. All sizes are listed in descriptions.